Have you tried okra before? As am sure you know, they are also called ‘ladies fingers’. Less well known is the vegetable called ‘gentleman’s toes’ – I kid you not! They are also known as ‘tindora’ or ‘ivy gourds’ – check out my recipe here if you interested – it’s actually super tasty. Anyway back to okra. I’ve been eating them a fair amount on my recent travels so thought I would continue to include them in our diet now that we are back home in London. Thankfully I live near loads of Asian grocers so sourcing them is very easy. I had a lot of positive feedback on instagram about sharing the recipe with you when I put it onto my instastories. 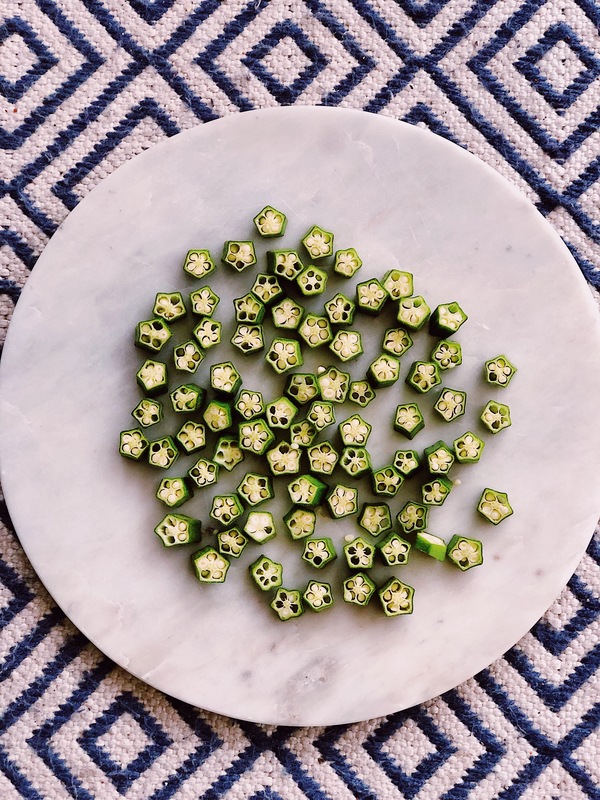 My friend, Harriet aka @thenutritionalbean who is a Registered Nutritional Therapist, Nutritionist and Health Coach, based in Bruton, kindly shared some nutritional facts on okra with me that I thought you would benefit from reading too. Makes you want to start including it in your diet fairly regularly right? Some people are put off with the texture, but I find if you dry the okra properly after washing then the gooeyness is minimal. 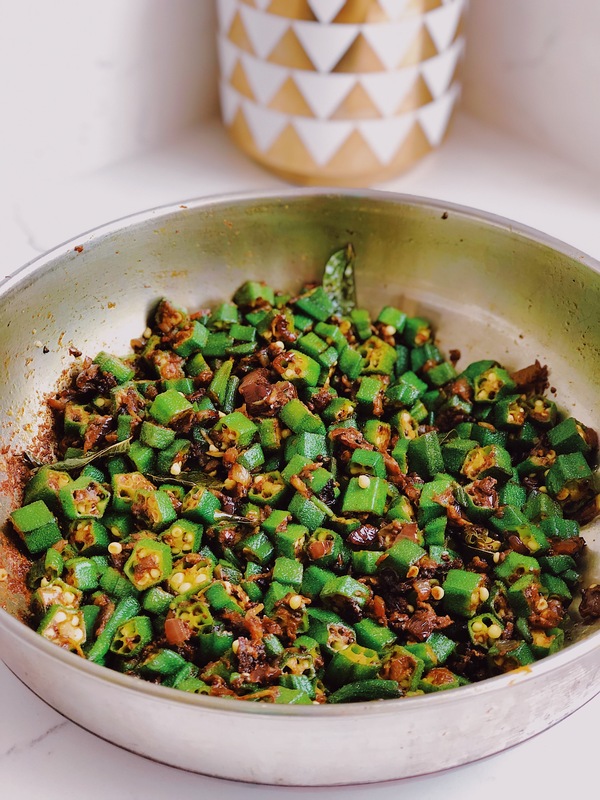 I have another similar recipe for okra here which uses less ingredients and has a slightly different taste. 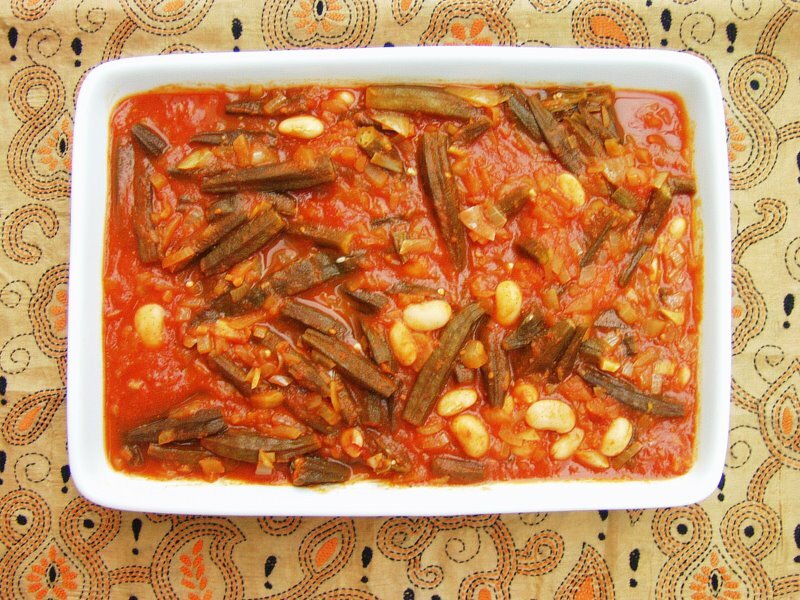 If you want to make the dish more Middle Eastern then try this one, which includes tomatoes and butterbeans. First wash the okra and then lay them out on a tea towel and cover with kitchen roll so that they become dry completely. Slice off the end of the okra and discard and then slice them, width ways, to one inch pieces, or you can slice on the diagonal, about three times per okra. In a deep frying pan or wok, add the oil and when it is hot add the mustard seeds and curry leaves for 20 seconds before adding the onion. Keep on a medium heat and move the onion around the pan for about 5 minutes, so that the onion begins to colour. Stir in the spices and then add the garlic, chilli, followed by the okra. Add the salt and gently fry for 10-15 minutes, moving the okra around the pan until it softens. This is a dry dish so do not expect there to be much of a sauce. The spices will coat the okra. I used to live close to the Edgware Road in London, which is the Middle Eastern part of town, well as Middle Eastern as it can be in London. It has a fairly chilled atmosphere with people spilling out of the cafes onto the pavements smoking their apple tobacco from their hookahs, when the weather permit and the sun shines. There are two things however that I really miss most about the Edgware Road. 1) Mandalay Burmese restaurant, which as the name states is not Middle Eastern but a Burmese restaurant run by the affable and learned Burmese brothers Dwight and Gary. The restaurant serves good, honest, home cooked Burmese food (cooked by Dwight and Gary’s female relatives). It tastes divine and the whole experience is very memorable. They have a little library up at the front with a few Burmese books, which you can peruse at your leisure whilst waiting for your dining companion to arrive. Whilst it won’t win awards for decor, it wins hands down on charm and substance. You need to book as it is often packed to the rafters. 2) Green Valley Lebanese mini market, which Mr B and I always referred to as ‘Valley of the Kings’ for some reason. It has a wonderful deli selling a huge array of salads, hot bread, stews, cheeses and a butcher selling good quality halal meat, as well as cuts you may not see at your typical English butcher – sheeps’ tongues anyone? In addition, it also sells a vast array of fresh produce and the best baklava in town, which they put together on platters for you. Basically they stock every interesting food product imaginable and this place is like a tardis in the amount of food that it holds. We would make weekly weekend trips to stock up on goodies. I was back there the other day buying some baklava (it’s worth the trip trust me), when I decided to buy a few little savoury edibles from the deli counter to munch in the car on the way home. Whilst making my selection my eyes rested for a while on the delicious looking okra and tomato stew. Whilst it isn’t so easy to transport and eat in the car, I decided to make some of my own when I got home and add my own little twist to the dish – butter beans. I do love my lentils and pulses and couldn’t resist adding them to the dish – for true purists amongst you simply skip the bit about adding butter beans. The dish tastes great warm or at room temperature with Middle Eastern flat bread. 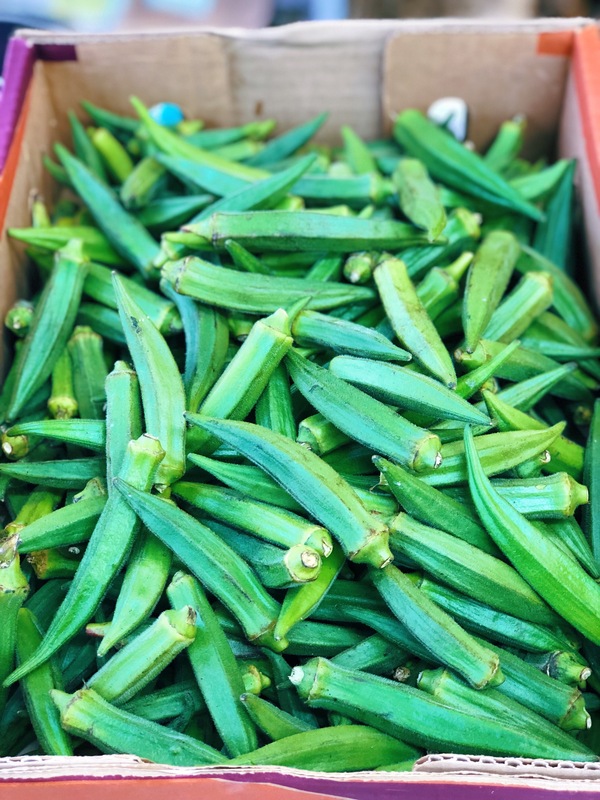 It takes no time to make and am sure can convert even those who are a little reluctant about eating okra (or lady’s fingers as it is also known). 1. Add a splash of olive oil to a deep pan and when it is hot add the chopped onion and garlic and stir a little until they soften and becomes translucent. This should take around 6 minutes. 2. Whilst the onions and garlic are softening, blend a tin of tomatoes with a hand blender until smooth. Before adding the blended tomatoes, add the ground coriander and seasoning and stir into the onions and garlic. 3. Add the blended tomatoes to the pan along with the tomato puree and lemon juice. Stir thoroughly and let simmer for a few minutes. 4. Add the butter beans and frozen okra and add a little boiling water so that the okra is fully submerged. Leave to gently simmer for 25 30 minutes, stiring gently, occasionally. 5. Taste and add more seasoning as required and serve with warm Middle Eastern flat bread. It could also be served with cous cous or steamed rice.